Cameron Highlands are known for their picturesque natural beauty. To add to the beauty of this place, there is Cameron Bharat Tea Estate that offers stunning views. As you stand on the hill and look at the valleys around, you will be blessed with breath-taking views over the emerald plantation. 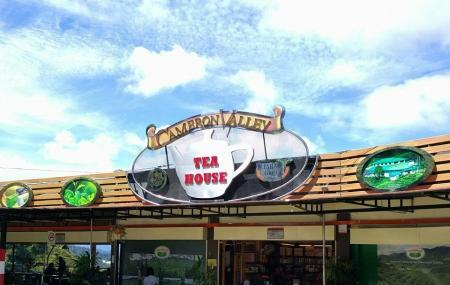 The signature brand 'Cameron Valley' is produced here. As you take a stroll around this place, you will be able to see a small tea house, and an open-air café that offers alluring views. Established in 1933, the Bharat Tea Estate has become an integral part of the landscape of Cameron. The best way to explore is to take a guided tour here. How popular is Cameron Bharat Tea Estate? People normally club together Big Red Strawberry Farm and Mossy Forest while planning their visit to Cameron Bharat Tea Estate. Beautiful views right off the side of the road as you driving south through Cameron highlands. There is an awesome hike you can do that comes out at the end of the tea fields for this nice view!